Scotch returned to the top three whiskies of the year named in Jim Murray’s Whisky Bible 2017 – but was beaten to the top spot by World Whisky of the Year Booker’s Rye. The 2017 edition of the Whisky Bible, published today, names Booker’s Rye 13 Years, 1 Month, 12 Days as its World Whisky of the Year, followed by runner-up Glen Grant Aged 18 Years Rare Edition, part of the the Speyside distillery’s revamped range and yet to be officially released. In a top three (as opposed to last year’s top five), William Larue Weller (67.3% abv) Bourbon took third spot. Scotch has failed to make the top five for the past two years, with Canada’s Crown Royal Northern Harvest Rye taking top spot last year. 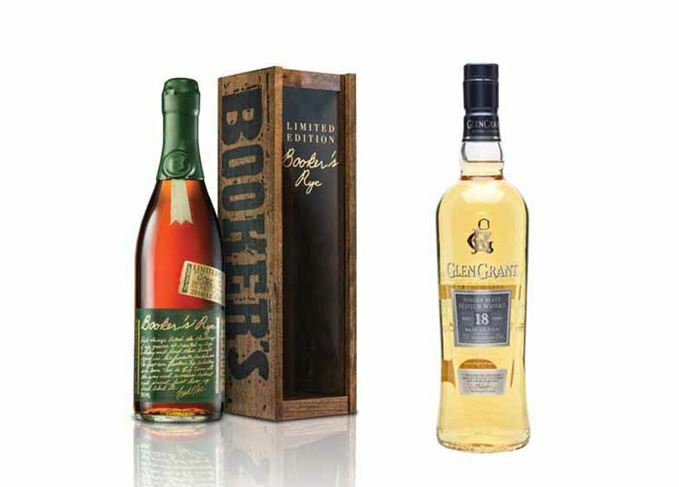 ‘The only whisky that was a realistic threat to the Booker’s Rye was the Glen Grant 18-year-old, a single malt unveiled for the first time in 2016,’ Murray writes in his introduction. Glen Grant picked up a number of awards in this year’s Whisky Bible, including Scotch Whisky of the Year, Single Malt of the Year (Multiple Casks) and Single Malt Scotch, 16-21 Years (Multiple Casks) – all won by the 18-year-old; and Single Malt Scotch, 10 Years & Under was won by Glen Grant 10-year-old. Two independent bottlings, Gordon & MacPhail Glen Grant 1952 and Gordon & MacPhail Glen Grant 65 Year Old, were also recognised. In a good year for Speyside, Glentauchers also won two awards and Macallan one, all for independent bottlings. The Booker’s Rye began life as an experiment by Booker Noe, grandson of Jim Beam, shortly before his death in 2004, and scored 97.5 out of 100 in the Whisky Bible. Praising its ‘brain-draining, mind-blowing’ nose and finish of ‘amazing depth’, Murray calls it a ‘staggering example of a magnificent rye, showing exactly what genius actually means. A very big, unforgettable whiskey from a very big, unforgettable man’. Jim Murray’s Whisky Bible 2017 is published today and priced at £12.99.